The Alpha 7 Package for the Nissan GT-R is designed for those who want to maximize output from the factory turbochargers. After Alpha received requests to build a package around the stock turbo's, they designed a setup that would utilize the factory twin turbos. Luckily, Nissan left a lot of power potential on the table when they designed the GT-R. By opening up the exhaust, and creating better flow with a tuned downpipe and exhaust system, Alpha was able to increase boost and efficiency. Using improved intakes, a larger intercooler and boosting fuel delivery, the GT-R potential can start to be unleashed. Combined with improved cam timing and revised fueling maps, the Alpha 7 Package for GTR raises output to 700hp and 700tq-while still on pump gas. Once installed, you will notice a much sharper throttle response with quicker turbo spool creating a huge power band. 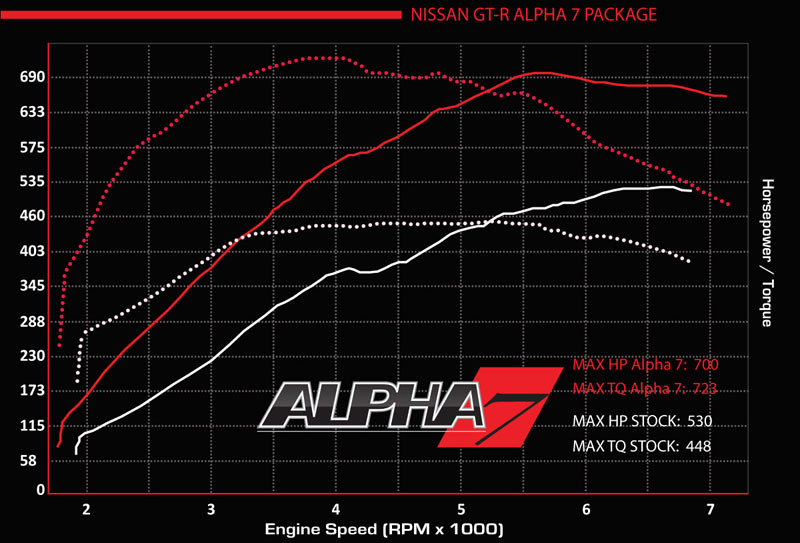 At just 2500rpm, the Alpha 7 GTR kit provides an extra 120hp and 270tq versus stock. This massive increase in power under the curve is certain to heighten your driving experience to new levels. At partial throttle, the Alpha 7 performance kit behaves exactly like it did the day you drove off the dealership lot. Thanks to the fine tuning Alpha has worked on, daily driving will seem civil. However, punch the throttle and the insane asphalt shredding horsepower and torque will be unleashed helping you to easily surge past the competition. The Alpha 7 provides a massive increase in power, but is upgradeable. Later down the road when you decide that the Alpha 7 package isn't enough, you can easily upgrade to the Alpha 9 setup without having to start from scratch.